While Kevin primarily serves Tyler and East Texas as a custom home builder, he also offers quality commercial construction. Among the projects recently completed are Good's Pharmacy and the Hembree Chiropractic Clinic on Grande Avenue in Tyler. Kevin also assisted in the design of a medical facility for Dr. David Martin in Trenton, Georgia. 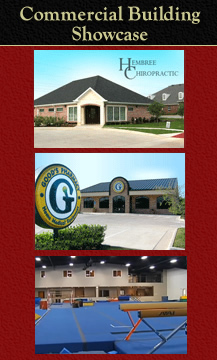 In 2014, Kevin completed the construction of the new 21,000 sq ft Texas East Gymnastics facility near the corner of Paluxy and Grande Boulevard. Kevin's background in engineering and management assists him in interfacing between the owner, architects and engineers associated with the commercial project. Value engineering is a key component in the development of all project plans and documents. Kevin's goal is to create an attractive, functional building at the most cost efficient price possible. Allow Kevin Humphrey the opportunity to provide a quote for your commercial construction needs.